Sorry again to bore you all with another UPDATE but this one is simply to let everyone know that I have officially eliminated my landline number (941) 346 1930 and from now on you can only reach me on my cell phone(941) 504-9053 (calls and text). I've been meaning to do this for a long time now but honestly I am so sick and tired of getting endless sales, etc calls on the 346 number and I get most calls on the cell. Thanks. TWO GREAT ELVIS DISCOGRAPHY BOOKS!! I just got in TWO INCREDIBLY GORGEOUS and very informative books! One is the 1987 BEAUTIFUL Japanese record collection book. The other is the 2005 COMPLETE ITALIAN DISCOGRAPHY book. I can't say enough about them but if you collect Elvis releases from these countries they are a MUST. Obviously both have been out of print for years and years and are impossible to find in especially MINT condition like these two are in. Yes they are expensive but honestly they are well worth it. If you've been looking around for these for awhile this is the time to finally get them. Only 1000 or less of both were printed and they were mostly sold in Italy and Japan. COMMENTS - INCREDIBLE approximately 10" x 11" almost 300 pages with FULL COLOR pictures and a gorgeous layout! BEAUTIFUL HIGH QUALITY PAPER, etc etc! It's a MUST for Elvis collectors! - This long out of print MONSTER of a book without question is the BEST book ever published on any country's individual vinyl releases. Nothing I've seen in 44 years has rivaled it. If you're a collector of worldwide releases on Elvis this is a MUST as it has everything a REAL collector would want - information on ALL label variations, all cover variations, etc etc with pictures IN COLOR of everything! I just wish every country could publish something even close to this for their own vinyl Elvis discography. - BUT that's not all it contains! It also shows pictures, etc of all Italian 8 tracks; movie lobby cards; magazines, special Italian photos, postcards, video tapes, RCA ITALIANA catalogs, books; all kinds of memorabilia, etc - all from Italy. I have no idea whose collection (s) these came from but it is INCREDIBLY IMPRESSIVE!!! - it probably weighs over 6 pounds because of the incredibly gorgeous and expensive binding, paper, etc and the high postage cost of getting this from Italy. 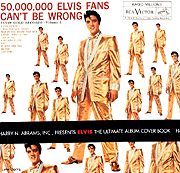 The authors spared no expensive in producing one of the if not THE finest Elvis discographies EVER!! - APPROXIMATELY 750 COPIES PRINTED WHICH WERE MAINLY SOLD OVER THERE!! - From the author - Maurizio Maiotti: "The first idea for this project was kicked around several years ago while flipping through two catalogues covering Elvis's records issued on the Italian market. They were the works of my good friend of 30 + years Livio Monari and another good friend, the late Carlo Colla. The former had compiled a short and detailed work. Costly color reproductions of record sleeves could be obtained from its author only on demand. On the other hand, Colla's guide was more exhaustive but contained less-than-perfect black and white-only reproductions. Hence the thought to arrange a newer catalogue with color photos of all the artist's Italian vinyl issues, including rare, alternate and special editions. After a revision of the respective record collections, the authors felt sure they could launch the project and started researching for missing discs. As the work progressed, they realized that the project could be extended to other areas where Elvis's name and image had been used - postcard sets, magazines, books and various memorabilia. It took us them feverish years to complete the task. Some 45 record sleeves as well as magazines, RCA promo literature etc., although known to have been released or printed, are still missing and/or couldn't be traced. The end result is this book which may not be the definitive catalogue of Elvis's Italian releases but very nearly so." - TRUST ME!! You have NEVER EVER EVER SEEN A BOOK like this before regarding a discography of Elvis!! I LOVE IT and you will too!! - THIS BOOK IS TOTALLY 100% MINT! JUST LIKE IF YOU BOUGHT IT IN 2005! COMMENTS - Incredible 124 page 12" x 12" 1987 MASTERPIECE book with BEAUTIFUL full color pictures of every Elvis Japanese 78's, 45's, EP's, LP's, promotional records from 1955 - 1985!! - ABSOLUTELY BEAUTIFUL full color LP SIZE DISCOGRAPHY book only available by mail order in 1987. Only around 1000 copies were made and it quickly sold mostly to Japanese collectors! - Published by Elvis Shuppankai November 30, 1987! - Cover is a very heavy full glossy issue and all of the pages are printed on top quality heavy duty glossy paper! - Full color photo of every single, EP, and LP released in Japan complete with catalog numbers and song titles on each item! - Great index in the back. This enables the reader to go to any song and be able to reference what single, EP, LP it can be found on! - Back cover is the great LOVING YOU front cover! - If you collect Elvis records from Japan this book is a MUST!! - This will be sent out to customers in the U.S. for $10 MEDIA MAIL unless you prefer PRIORITY which will be $19. For overseas fans please see E MAIL ME! - Yes this is an expensive book but WELL WORTH THE PRICE. I very rarely see this on eBay but when I do it's usually in only GOOD condition....not like this one! - THIS BOOK IS TOTALLY MINT! JUST LIKE IF YOU BOUGHT IT IN 1987! Please click on the photo for a large scan of the front, back, and many of the insiden pages! TITLE THE ELVIS EMPIRE JAN 7 & 8, 2006 COLLECTION CATALOG! COMMENTS - This was a special HUGE 282 page (8.5" x 11") catalog issued by REGENCY SUPERIOR auction house selling the now deceased(AND very good friend of min) Jim Curtin's gigantic Elvis collection! I met Jim in September 1973 and we would talk and trade Elvis vinyl until he died. A really great knowledgable guy who taught me a lot. promotional items, EPE enterprise items, posters, etc etc etc. - Trust me, the "DARBY DEVIL" had it all! And this book proves it!! - Beautiful pictures! Not sure how many but there have to be way over 1000!! - Just look at the scans I have attached of the contents of the book! - THIS IS A MUST FOR ANY ELVIS COLLECTOR WHETHER IT BE VINYL, MEMORABILIA, REEL TAPES, ETC ETC, ETC ETC! - ONLY ONE COPY! BUY IT NOW! COMMENTS This FULL COLOR book was done by ME (Paul Dowling) in 1996 and contained over 200 photos of 78's, singles, EP's, and LP's from many, many countries. If you want to see what RCA did with ELvis picture covers from all over the world and see some very unusual designs, this is the book to have. It is now out-of-print but I still have a few left. COMMENTS - Incredible 202 page 9" x 12.5" HARDBOUND BOOK by Elvis authority and friend Paul Lichter! - This 1992 book set the standard for all Elvis books and was an immediate sellout & became an instant collectible. - With never before told stories from Bill Black's brother, Elvis' Memphis girlfriend, unknown until now - Another exclusive: Colonel Parker talks about his relationship with Elvis in a candid & personal way that you've never heard before - Every page is hand sewn! - Every exclusive photo, many from Elvis' own personal photo album, are printed full page on 100 lb. coated enamel fine art paper - All in glorious color - All are world premier photographs published here for the first time! - LIMITED NUMBER PRINTED!! Comes with CERTIFICATE OF AUTHENTICITY page with Registration Number! - THIS BOOK IS TOTALLY MINT...... UNLIKE SOME COPIES ON E BAY WHICH ARE "PRE OWNED" (WHATEVER THAT MEANS!! )!